You would think that after six years of living with food allergies, we’ve got it all down pat. But one can be a little too complacent and too trusting. We ended up spending Thanksgiving in the ER because we assumed, and wrongfully so, that after this long our extended families understood exactly what they were dealing with. 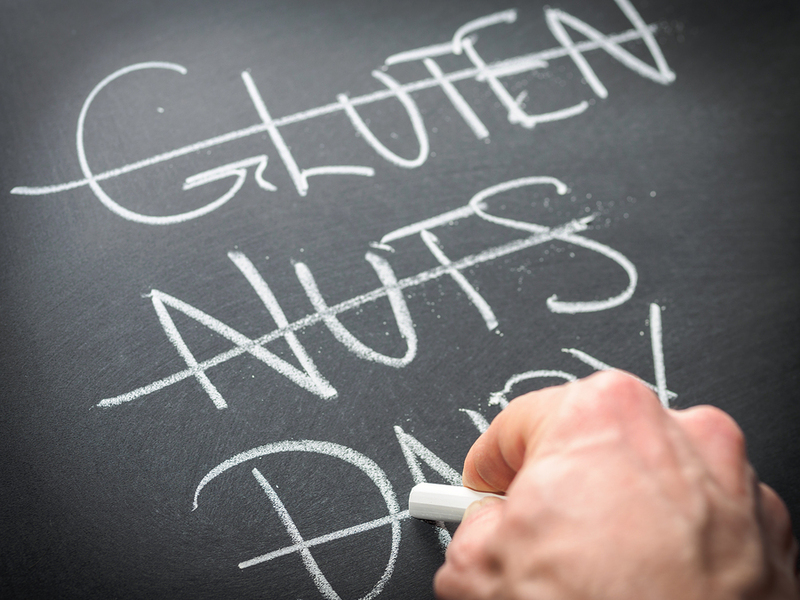 Food allergies can be extremely complex and poorly understood, and so there’s nothing beneficial about playing blame games. Even when everyone is being super cautious, accidents can happen anyway. That being said, it doesn’t have to be difficult to minimize risks. Probably not surprisingly, what you need to know is mostly about knowledge and control. Assume that if you were told about it specifically, the food allergies are serious. Allergies can be much more than sneezing and wheezing. A food allergen exposure can also result in anaphylaxis, an acute reaction that can cause death. Unless you have been told otherwise, there’s really no downside to being ultra-cautious and assuming the worst case scenario, because even if an allergic reaction is not fatal, it can mean discomfort and suffering to your relative or friend. Ask questions and use some thoughtful planning – What is the allergy to? What sort of things should be avoided? What things are safe? How severe is the allergy? If you don’t understand your relative or friend’s allergies very well, you should be responsible and ask them for more information. Then you should make some effort to ensure that their safety is considered. Is there a small child with nut allergies? Perhaps you should skip the snack dishes of mixed nuts and opt for plain chips instead. Avoid putting out messy finger-foods containing the allergen so that people won’t accidentally wipe the food on surfaces that the person with allergies may touch. Many allergy sufferers simply have to be careful to avoid consuming or touching the products containing their allergens, but some people have allergies so severe that they can’t even be in the same room. Anaphylaxis caused by aerosolized particles is no myth, and so if you discover that someone has an extremely severe and possibly airborne reaction to something, such as peanuts, you should ensure that that allergen cannot be found anywhere in your home while they’re over. Make real food instead of cutting corners. Yes, the holidays are busy, but reading convenience food’s labeling and identifying sources of cross-contamination is where a lot of people screw up. Skip the pre-stuffed turkeys. Completely avoid the deli-counter goods, the bakery section, and the bulk goods aisles. Avoid the canned gravies and boxed cookies and instant-mashed potatoes. The more you make from scratch (in a clean kitchen), the better your control. If you do cut corners, keep or photograph the ingredient labels so they can be double checked. No matter how careful you are about reading labels, and how much you think you know, the parent or allergy-sufferer probably can identify their allergens better than you can. Email them the photos of labels and confirm recipes ahead of time because many of the allergens could be referred to as a protein or a product that may be difficult for you to identify. Would you recognize nougat or whey as a dairy product? Or albumin as egg? You should also know everything listed as a “may contain” should be considered a “does contain.” So if it “may contain” traces of tree nuts? Your nut-allergic relative can’t have it. Use the awesome power of Google (and for the love of Pete, use something more legit than Yahoo Answers). There’s tons of information out there on specific types of allergies, hidden ingredients and substitutions. You want to know how to substitute oil for butter in cookies? Google it. You want to know hidden sources of dairy or other allergens? There’s lists for this too. Ask them for their recipes, and/or invite them to contribute food. Stumped for ideas for a gluten-free, vegan dessert? I’m sure they’d be happy to bring one. Don’t take offense if a person with severe food allergies brings their own meal, or refuses to eat something you have made even if you try to accommodate them. As terrible as having an ambulance showing up in your driveway is to you, imagine how terrifying it is to the person having anaphylaxis, especially when the allergy-sufferer is a child. If someone is uncomfortable eating your food, it’s more than likely that this person has had a severe reaction at least once already, possibly even from eating something from someone they trusted. Please don’t force them or get upset with them. It’s not personal. It’s simply fear. This list is by no means exhaustive. To increase your information and awareness about food allergies further, especially if you have a loved one with food allergies, please visit Anaphylaxis Canada and Food Allergy Research & Education to find more tips in accommodating their specific allergies and needs. We also live with an anaphylactic allergy. Most of our family is very accommodating, but some just don’t get it. I can’t emphasize enough, when in doubt, don’t be embarrassed to bring your own food. Great post Anne. Thanks, Leslie! Yes, for the sufferers–you are right. Better safe than sorry. Anaphylaxis Canada’s official stance is… if you don’t have your Epi-pen? Don’t eat.